Dulwich College Shanghai interview Head Boy Johnnie and Head Girl Mao about their experiences in university preparation. What year did you join Dulwich College Shanghai and the Road to University Pathway? Johnnie: I joined Dulwich College Shanghai in Year 6 and have followed the 'Road to University Pathway' from the beginning in Year 7 to Year 13, my final year. Can you please share your first university counselling experience? Mao: I joined the College in Year 8. In my earlier years, I explored my personality and my interests, to try and pinpoint a career I would be interested in. I then brought this down the track, exploring what subjects would be required for my desired courses and careers. Did the University Counselling influence your option selection in Year 9? 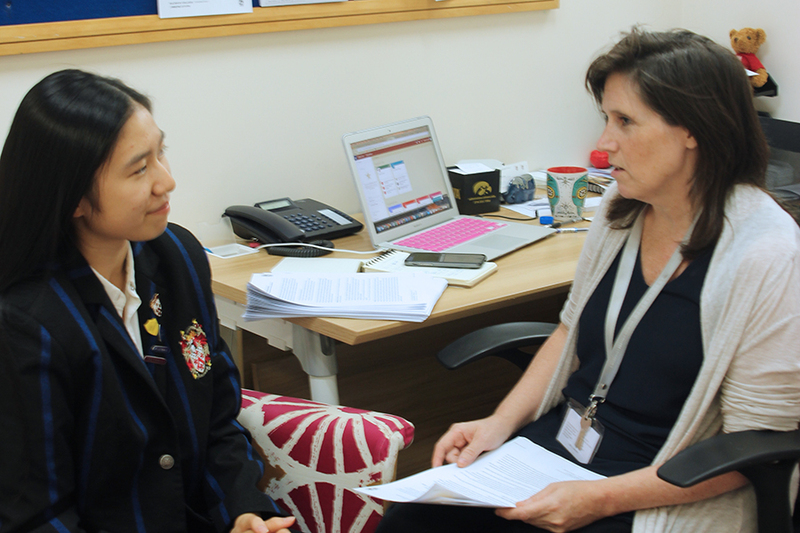 Johnnie: During Year 9 students were required to produce a Senior School Plan to improve study skills, select IGCSE classes, and explore new co-curricular activities. The university counselling Team spends as much time as necessary to get to know students individually to make the best course selections for each one of us. I had a special case in Year 9 where I was the only student in the entire year group to have chosen a specific subject combination of Chinese Literature, History, and Economics, and the combination presented scheduling issues. The counselling Team were able to fully resolve the issue for me. How did the university counselling team engage in your university planning progress? Mao: The University Counselling Team guided us through the whole process, from writing our personal statements to securing our university list. They advised us on considering the best courses for us for the IGCSEs and the IB, that would best prepare us for university. As my counsellor got to know me better, she was extremely helpful in assisting me to find the ‘best fit’ universities, where I would feel the most happiest and satisfied with my university experience. They also encouraged us to start attending university fairs at an early stage, which really helped me in Year 12, as I had already done quite a lot of research, and had a brief idea of what types of institutions I was looking for. What was the highlight of University Counselling in Year 11? Mao: After several discussions with my counsellor, I was able to select the subjects that I not only loved, but also ones that would best prepare me for my courses. At times, it seemed daunting that our subject choices can change our university options, however they were always there to help out, to suggest combinations which would best accommodate my needs. In addition, I attended a summer school which helped me to build concrete plans on what I wanted to major in, as well as on a brief insight into what university life. Did the University Counselling continue during your IBDP? Johnnie: Yes, certainly students in Year 12 and Year 13 are fully supported throughout the university application process. I began my process early, so I now spend the majority of my time discussing career orientations and future aspirations, whilst some of my peers focus on their priorities. This may be building their own university lists, preparing for standardized tests, like SATs/ACTs, and visiting universities worldwide. It’s an extremely personalized process. Now in Year 13, what are the final steps to the 'Roadmap to University’? Johnnie: This year I will be focusing on completing my personal statement, maintaining my academic efforts, requesting teacher recommendation letters, and submitting my university applications - quite the standard list for final year students. I also attend all the university events that take place on campus whenever a college I’m interested in has a representative visiting. Hopefully, in June 2018 we can all celebrate our successes!